The Million Hearts initiative has been successful at the national level in bringing diverse stakeholders together to address cardiovascular disease (CVD). As an information-sharing network, Million Hearts has succeeded. 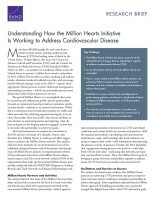 There is some evidence that Million Hearts partners are achieving CVD prevention and process improvement outcomes and are working to strengthen partnerships to achieve these goals. Facilitators to success include trust and alignment of goals among partners, and barriers include lack of direct funding and different perspectives on CVD prevention among partners. The network can be kept intact as is, but there are ways to enhance it and strengthen the current level of commitment and activity from its membership. More than 800,000 people die each year from a stroke or heart attack, making cardiovascular disease (CVD) the leading cause of death in the United States. To help address this issue, the Centers for Disease Control and Prevention (CDC) and the Centers for Medicare & Medicaid Services (CMS) launched Million Hearts in 2011 — an initiative to coordinate efforts across the United States to prevent 1 million heart attacks and strokes by 2017. Million Hearts seeks to reduce smoking and sodium intake, eliminate intake of artificial trans fats, and encourage healthy lifestyle changes, such as the ABCS — aspirin when appropriate, blood pressure control, cholesterol management, and smoking cessation — which can potentially prevent more deaths than other clinical preventive services. The goal of Million Hearts is to accomplish these aims by nurturing and influencing public–private partnerships focused on community-based prevention to promote cardiovascular health — referred to as network interventions. While there is consensus that network interventions are viable and often successful for achieving organizational goals, it is not clear what makes them successful, what factors facilitate or pose barriers to potential partners participating, what the best strategies are for keeping partners engaged, or how best to structure the partnership to achieve its goals. This brief summarizes an analysis by researchers at RAND and the University of Colorado, Denver, that describes how Million Hearts is working and offers suggestions to enhance the Million Hearts network. The analysis relied on three methods: (1) an environmental scan of the published and gray literature and of documents and descriptions of Million Hearts projects on organizational websites, (2) key informant interviews with Million Hearts subject-matter experts, and (3) a social network analysis (SNA) of the organizations that make up the national Million Hearts partnership conducted with the PARTNER (Program to Analyze, Record, and Track Networks to Enhance Relationships) tool. The analysis showed that most of the Million Hearts partnerships and activities occurred at the local level and were often not directly associated with organizations involved in the core national Million Hearts partnership — federal agencies and national associations with interests in CVD and related conditions and various health care systems and practices. Still, the national partnership is developing tools and resources (information, tools, and branding) that local initiatives are using to support their work — with information-sharing being the primary activity of partners. Further, the SNA identified that engagement among partners was positive — with high levels of trust and value — indicating that network participation was beneficial to them. Thus, the Million Hearts goal of bringing a group of diverse stakeholders together to address issues of CVD has been successful at the national level. The analysis also found some evidence that Million Hearts partners are achieving CVD prevention and process improvement outcomes and are working to strengthen partnerships to achieve these goals. Some respondents reported that the Million Hearts approach of building partnerships was a particular strength that helped them achieve their CVD prevention goals. As a result of participating in Million Hearts, some respondents identified changes to their CVD prevention activities, including focusing on raising awareness of the ABCS, providing resources for sharing among stakeholders, developing new programs, and facilitating communications between sectors and agencies. These successes were facilitated by an alignment of goals among partners, the attainment of buy-in from the organizational leadership of participating organizations, good communication between partners, diverse partner sets, trust, the recognition and leveraging of the resources of other members, and funding. Barriers included lack of direct funding, difficulties with bringing partners to the table, lack of experience among partners, and different perspectives on CVD prevention among partners. There was also some concern that more could be done to identify how to operationalize Million Hearts activities at the local level. The Million Hearts network effectively enables a diverse, cross-sector group of federal and private-sector partners to share information about issues related to cardiovascular health. Participation in the network requires only minimal resources for partners, and the return on trust and value among members is high, which shows that the network has created an effective information-sharing platform. The analysis also sought to address two questions: "Is there a 'network' without the federal co-leads (CDC and CMS) as a partner?" and "Are there other organizations that play the role of convener?" The SNA showed that CDC, while well connected, did not serve as a "bridging organization." As shown in the table, the kinds of activities partners engage in changed little when sensitivity analysis simulated the removal of CDC and CMS as a partner, indicating that the role that CDC and CMS play in these types of activities does not affect other partners' types of interactions. The Million Hearts network has been successful in many ways, particularly in engaging a diverse group of public and private partners in collectively addressing issues related to CVD. As an information-sharing network, Million Hearts has succeeded in reaching this goal. Thus, keeping the network intact, as is, can have some tangible benefits without a lot of additional resources or change. Maintain current programming but leverage existing activity and resources. Maintain current activity but focus on strengthening current levels of commitment and engagement among members. Reevaluate current activities, focusing on some partner-generated activities. Review the purpose of Million Hearts and consider revising goals, member expectations, and/or governance. Develop diversified funding strategies to support the work of Million Hearts. Adopt other strategies for sustainability suggested by partners. Malcolm V. Williams, Danielle M. Varda, et al. Williams, Malcolm V., Danielle M. Varda, Ryan Andrew Brown, Courtney Armstrong, Praise O. Iyiewuare, Rachel Ross, Kayleigh Newman, and Sara Sprong, Understanding How the Million Hearts Initiative Is Working to Address Cardiovascular Disease. Santa Monica, CA: RAND Corporation, 2018. https://www.rand.org/pubs/research_briefs/RB9982.html.